Sigma 120-300mm f2.8 EX DG OS HSM S Canon and Nikon mount lens review: Prime image quality in a zoom? A large aperture 300mm is an essential lens for sports and action photography, but the f2.8 versions are expensive. What’s more, they’re not particularly versatile, making the cost of ownership all the more difficult to justify. Before the introduction of large aperture 80-200mm models in the 80s, fixed focal length primes such as the 180mm and 200mm f2.8 models were hugely popular but that’s no longer the case. Telephoto zooms may have replaced those models, especially now that modern designs are close to matching the optical quality of the primes, but the 300mm f2.8 has endured for decades. At first blush, the full-frame Sigma 120-300mm f2.8 (Nikon mount, Canon mount) looks like a promising option. 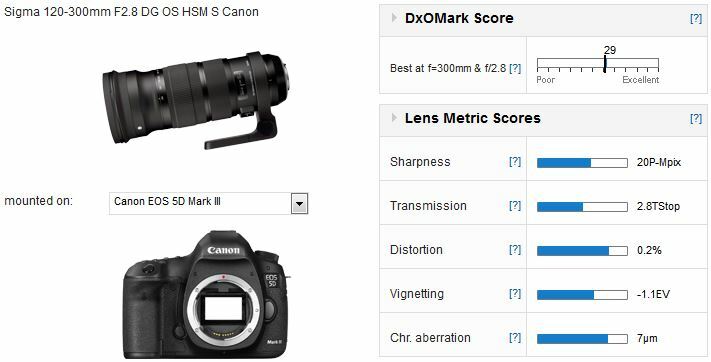 And, at around $3,600, it’s just 50-60% of the price of a 300mm f2.8 from Canon or Nikon. Not only that, but it could also replace the 70-200mm f2.8 for certain applications. This new model is a revamp of the 2010 iteration, which added stabilization and weather-sealing to the ultrasonic motor of the original, and boasts Sigma’s new high-grade exterior finish, as well as a new focus limiter option. Internally, it adopts the same complex construction of 23 elements in 18 groups, focuses to an unusually close 0.15-0.25m and weighs in at a not unreasonable 3.39Kg (119.6oz). 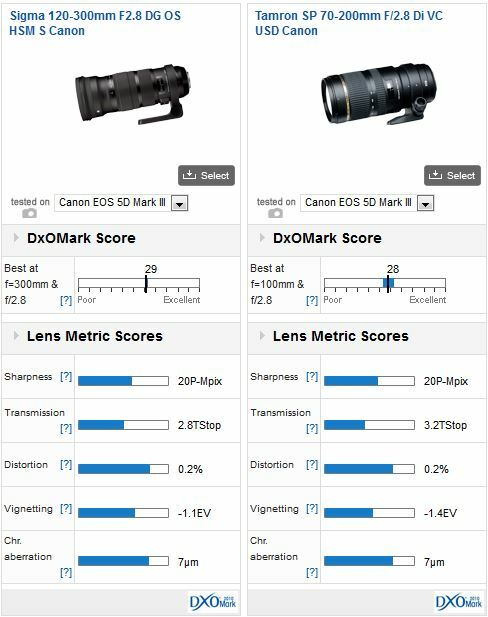 Sitting at the top of our rankings for telephoto zoom models on the Canon EOS 5D Mk III, the Sigma is an excellent performer. 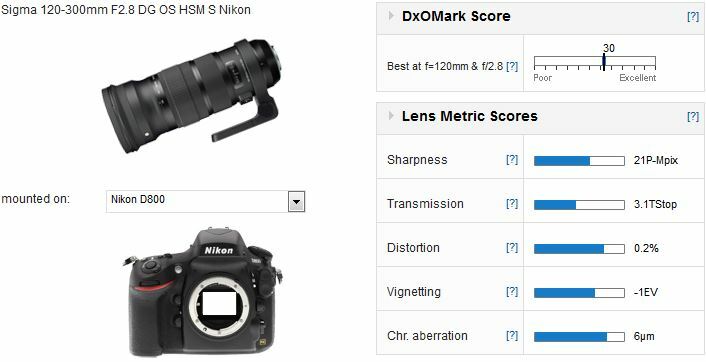 The Sigma performs very well on the D800, but it narrowly misses out on the top spot. 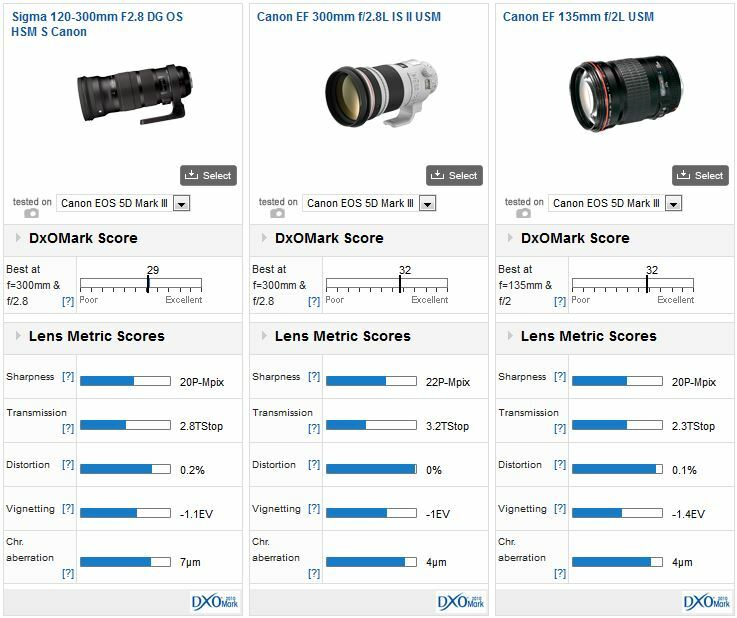 With a high DxOMark lens score of 29 points, the Sigma lens shows that it’s a match for Canon and off-brand rivals in image quality. It has a very high sharpness score at 20P-Mpix and performance doesn’t fall off at 300mm, as it does with some lesser models. Transmission is excellent and while there’s some pincushion at the longer end it’s generally well controlled. Vignetting is more noticeable at 300mm as well but it’s less important now with software correction and few people can argue that it doesn’t help with the look of some images. Chromatic aberration is low generally, appearing at the shorter end of the zoom range at full-aperture mostly, rather than at 300mm. As you might expect, the Nikon version performs similarly to the Canon mount. That said, given the 36-Mpix sensor of the D800, sharpness levels are high but they’re not quite as lofty as we expected. Set to full aperture, the centers are noticeably sharper than the periphery throughout the zoom range. And, the performance across the field isn’t quite has high at 300mm as it is at 120mm. However, on the plus side, vignetting is lower, as is chromatic aberration but in real world use the difference is negligible between the two versions. Compared with the Tamron 70-200mm f2.8, the Sigma is just ahead in overall image quality when mounted on the Canon EOS 5D Mk III. 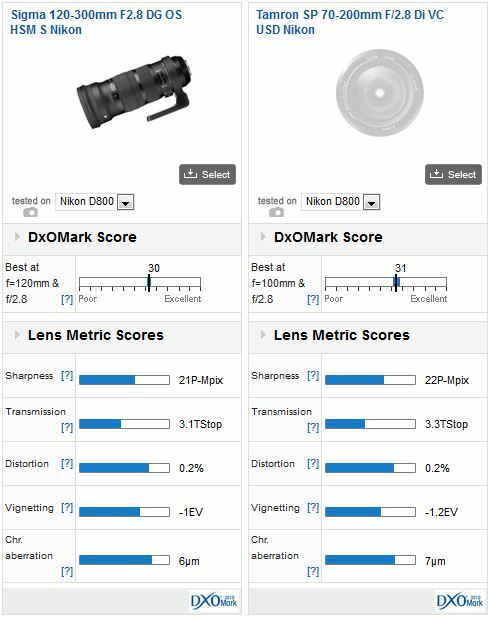 Both achieve a similar overall score for sharpness, but the two perform differently. Where the Tamron is bitingly sharp at 70mm, levels drop off quite considerably at the longer focal lengths. The Sigma on the other hand is consistently sharp throughout and is actually sharper at 200mm and onwards, and with lower distortion. That works well for the Sigma, where performance at the longer-end is often most needed but difficult for makers to achieve. 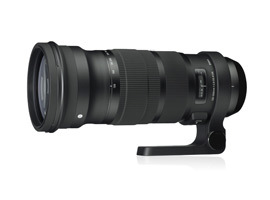 The Sigma also performs well against the high-performing Canon 300mm f2.8L and 135mm f2.0L models. It comes very close to the performance of Canon’s premium 300mm even at full-aperture, though, as you might expect, it’s not quite at the same level. Even if it can’t quite match the 300mm the Sigma isn’t far off the 135mm f2.0. It has similar levels of sharpness and slightly better illumination at f2.8. However, bear in mind the 135mm is brighter, and better corrected for distortion and chromatic aberration. 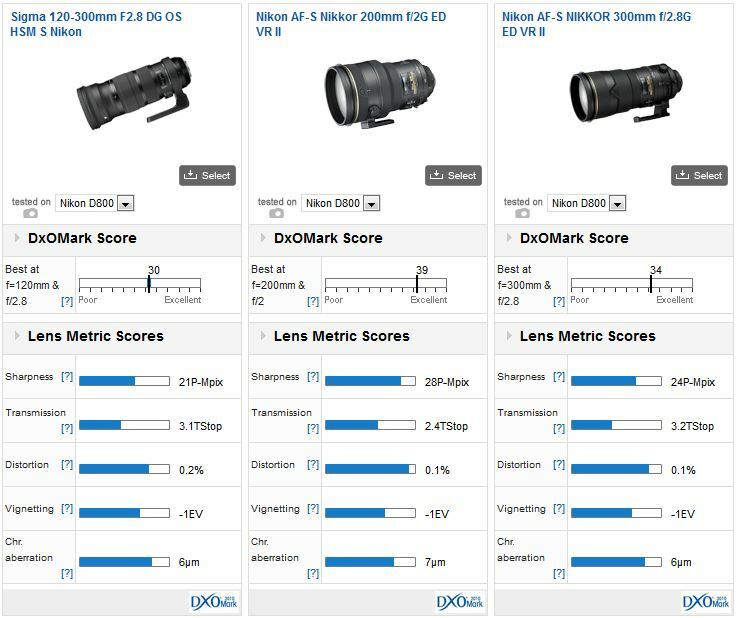 Measured against the Nikon mount Tamron, the Sigma compares favorably. Like the Canon mount version, the Tamron loses out at the longer end, though the D800 sensor manages to extract a little more sharpness wide open at 200mm from it than the Sigma at the same setting. All the same, the Sigma has lower distortion and vignetting and even has better control of chromatic aberration at the longer focal lengths, though the reverse is true beneath 200mm. We were curious to see how well the Sigma stacked up against the outstanding Nikon AF-S 200mm f2.0 (we haven’t yet seen the Canon equivalent). Unsurprisingly, both the 200mm f2.0 and 300mm f2.8 are noticeably sharper, and, from f2.8 down, have lower distortion, vignetting and CA. While that is disappointing, with such a good overall performance the Sigma may well remain in contention. Previous iterations of this lens lacked certain features to compete directly with the premium offerings from the rival marques. But, to their credit Sigma has addressed each shortcoming with the relevant upgrade. While this has increased the price each time, the current $3,600 ticket is still well under what you would currently pay for either the Canon or Nikon 300mm f/2.8 models. Not only that, but it may even save buying a 70-200mm f/2.8 in certain cases. Given the potential savings and the excellent optical performance, the Sigma must be worth a closer look.